A successful investor understands the importance of adding well-performing stocks in the portfolio at the right time. Notably, indicators of a stock’s bullish run include a rise in its share price and strong fundamentals. 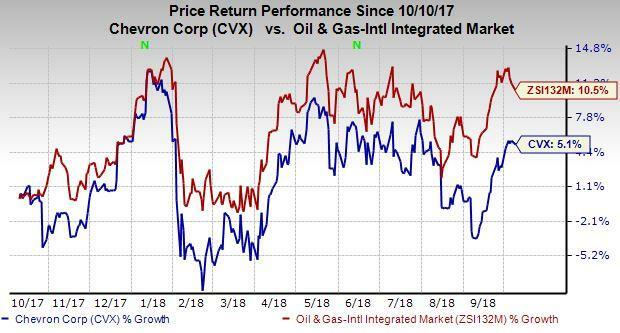 Chevron Corporation CVX is one such shining star in the Oil/Energy sector, which has been on a healthy growth trajectory. Shares of Chevron are up nearly 100% from August 2015 lows and are poised for further capital appreciation, riding on healthy earnings growth prospects. While shares of Chevron may not have had a very impressive run on the bourses over a year, with the stock moving up 5.1% compared with the industry’s rally of 10.5%, one can certainly bet on the firm’s solid financial and operational performance. Let’s delve deeper to check out the reasons why Chevron is an attractive pick right now. The company’s substantial Permian holdings of 2.2 million net acres have already realized production growth of 35% in the past year, with Chevron targeting a compounded annual growth rate of 30-40% through 2020. Notably, Chevron’s Permian output accounted for 270,000 barrels of oil equivalent in the last reported quarter, representing a whopping surge from 92,000 Boe/d in the year-ago quarter and also ahead of its guided range. Notably, the company has been operating 20 rigs in the prolific shale play. Chevron is the chief operator of two of the mega LNG projects in Australia, namely Wheatstone and Gorgon, which are expected to significantly add to the firm’s total production and revenues in the coming years. The $54-billion Gorgon LNG project deals with the delivery of natural gas to international and domestic customers. Importantly, Wheatstone is fully functional now and Chevron has started production at its second unit of the project this June, thereby solidifying its position as one of the biggest suppliers of natural gas to the Asian countries. With these major projects starting production, Chevron expects an improvement in free cash flow. The projects are expected to drive long-term growth and boost shareholders’ value in the coming years. By 2020, the oil giant aims to become a major LNG supplier. Notably, Chevron is targeting total volume growth of 4-7% this year (excluding asset sales) from both its Australian mega projects and Permian operations. The improvement in cash flow from operations on the back of a favorable macro environment and Chevron's operational efficiency allowed management to raise its dividend by 4% early this year and announce a $3-billion per year share buyback program in the last reported quarter. During the last reported quarter, Chevron maintained its cash flow performance — an important gauge for the oil and gas industry — with $6.9 billion in cash flow from operations, up from $5 billion a year ago. The company is focused on ramping up its efforts to unleash a revolution in Australia’s LNG sector, via seeking greater collaboration from the industry players. Last month, it was reported that the company intends to develop its Clio-Acme field by sharing its infrastructure system with Woodside Petroleum Limited. Chevron views such a collaboration to be essential for the future development of offshore resources in an efficient manner, as it would result in cost effectiveness and minimum duplication of its infrastructure. A few days back, it was announced that the company inked a deal to divest its entire stake in the Rosebank oilfield to Equinor ASA EQNR, in a bid to streamline its portfolio and raise funds for future domestic capital expenditure. The decision to offload North Sea holdings seems to be a prudent one, as extracting oil from the region is not so economical since production costs are much higher than returns. Moreover, other biggies like Bp plc BP and Royal Dutch Shell plc RDS.A have also jettisoned their non-core assets in the region. Notably, in July 2018, Chevron decided to put up many of its North Sea oil and gas assets for sale. The move was part of Chevron’s strategic review of global portfolio to determine the competitiveness of all its projects. Chevron currently has a Zacks Rank #1 (Strong Buy) and a VGM Score of A. Our research shows that stocks with a VGM Score of A or B when combined with a Zacks Rank #1 or #2 (Buy) offer the best investment opportunities for investors. Thus, the company appears to be a lucrative investment proposition at the moment. You can see the complete list of today’s Zacks #1 Rank stocks here. Chevron seems to a broker favorite. Evidently, the Zacks Consensus Estimate for 2018 earnings has moved 2.4% north in the past 30 days. Given the wealth of information at brokers’ disposal, it is in the best interests of investors to be guided by broker advice and the direction of their estimate revisions. This is because the direction of estimate revisions serves as an important pointer when it comes to the price of a stock. So, if the stock does not hold a place in your portfolio yet, there is still time to add the stock, as it looks promising and is poised to carry the momentum ahead.